Armed with Rockefeller land and a government grant, the island citizens of Frenchboro have rolled out the welcome mat for ten new families. By Cynthia Bourgeault. An expert tells which of the state’s fairs might suit you best. By Robert Deis. There’s no place like home — especially if it’s a jewel-like antique furnished with antiques. Photographs by Brian Vanden Brink. Founded in 1869, the local yacht club is still guided by ‘confirmed sailing men.’ By Raymond J. Blair. Lobstermen enjoy a communion reserved for members only. By John Gould. A full-color tour of the wildlands affected by the proposed dam on the Penobscot introduces two opposing views of the environmental battle of the decade. Photographs by Joe Devenney. Taste and hard work have built a unique Maine garden. By Jane Lamb. Hundreds of islands, coves, and harbors make these often-overlooked waters a yachtsmen’s haven. Photographs by F. Stephen Ward and Joe Devenney . Two more success stories from the Pine Tree State. No one is better at it than Sonny McIntire of Perkins Cove. By Denise P. Johnson. There were times when I would make the most of a bad situation. When the motor would die, I would row to the nearest shore, pull the boat up on the sand, the dog would jump out, and we would explore the area. By Caskie Stinnett. 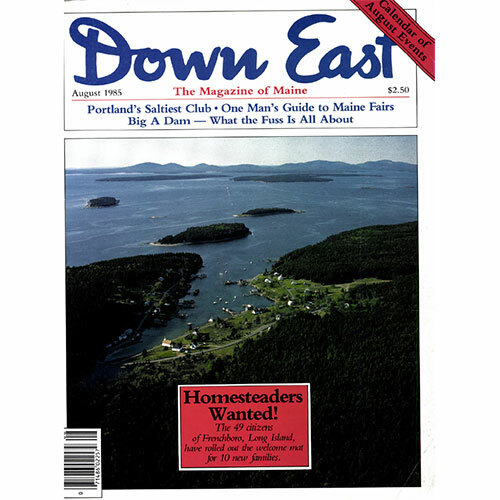 Cover: Frenchboro, Long Island, off Mt. Desert. By F. Stephen Ward.